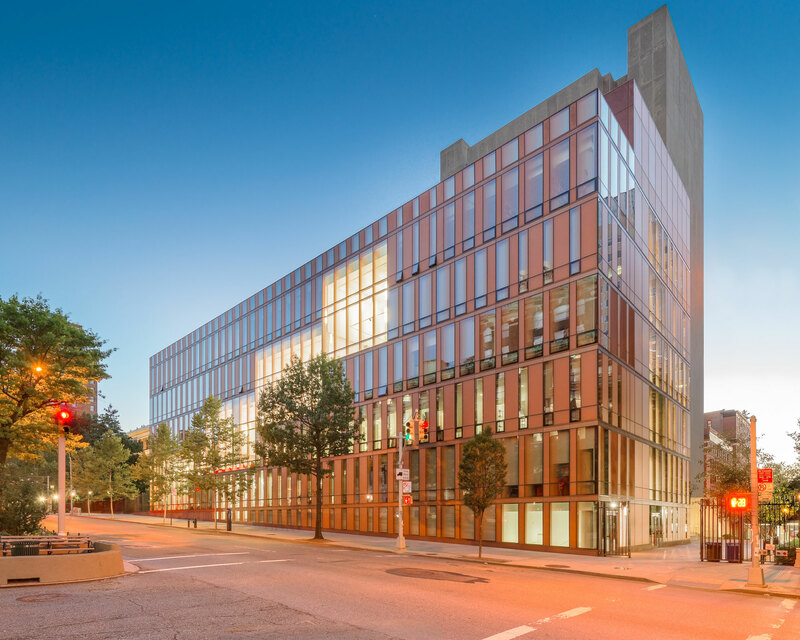 A seven-story mixed-use building and student center, designed to replace Barnard College’s two-story McIntosh Center, provides the compact, urban campus with an illuminated focal point along its Broadway border. 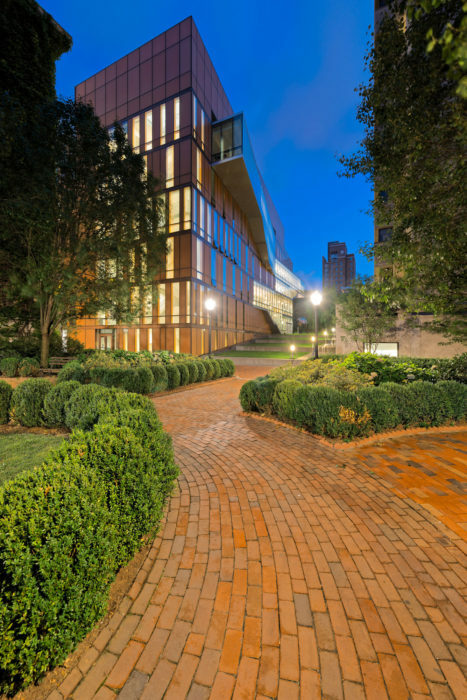 A skeptical board of trustees, partial to conventional brick-and-mortar, was persuaded by an all-glass facade design that references the aesthetic of the primarily brick campus. Varying modules of translucent spandrel glass and custom, ceramic-fritted glass create a rhythm that reflects the various needs of the center’s mixed-use programming. Heintges collaborated with the architect to develop the functional and aesthetic aspects of the project with equal emphasis, working toward the realization of a subtle and unique materiality in a cost-effective, all-glass enclosure. Composed of economical 5-foot-tall modules, the facade’s 1,154 panels respond to interior programming with variations in transparency and opacity. 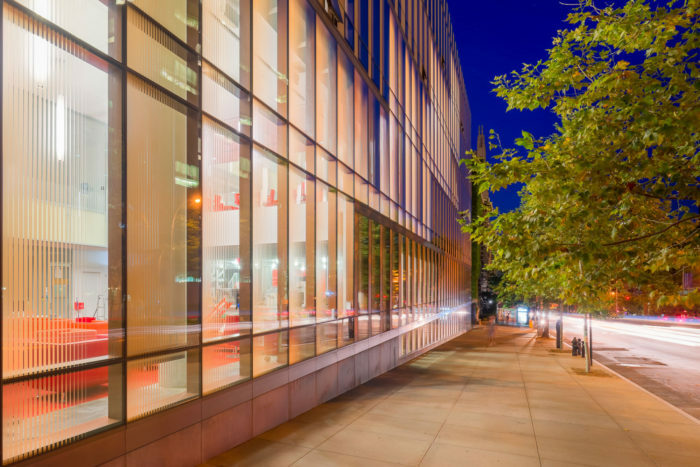 Stepped, double-height glazing on the public-facing facade creates a continuous atrium, drawing light into the core of the building and connecting Lehman Lawn to the green rooftop. Protruding glass ramps on the campus-facing facade expose circulation and provide peripheral views of Lehman Lawn to the south and Millbank Hall to the north. 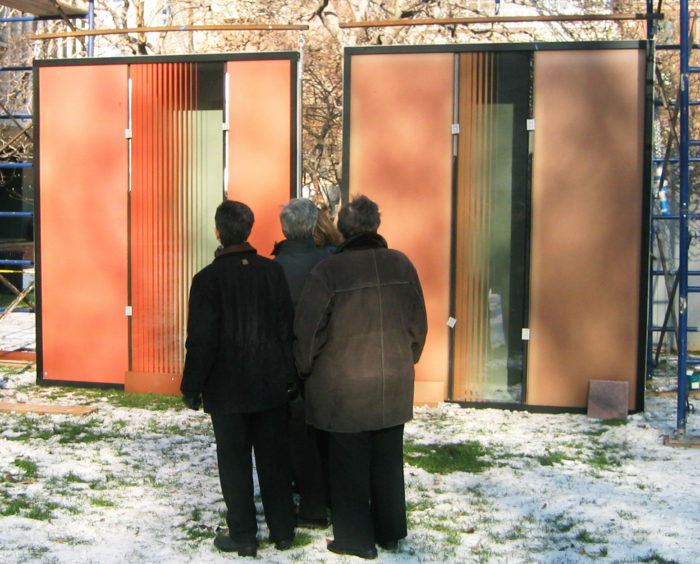 Extensive mockups tested the color of the facade’s glass in various light conditions. 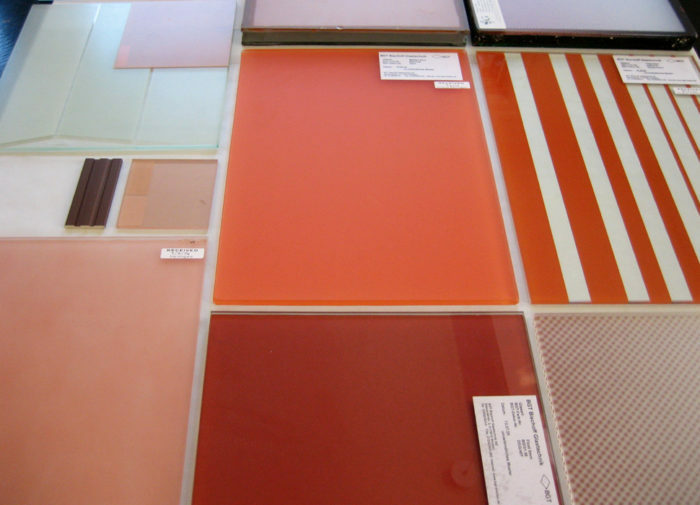 The result is a unitized system of transparent, fritted, and translucent glass over colored back panels. The acid-etched No. 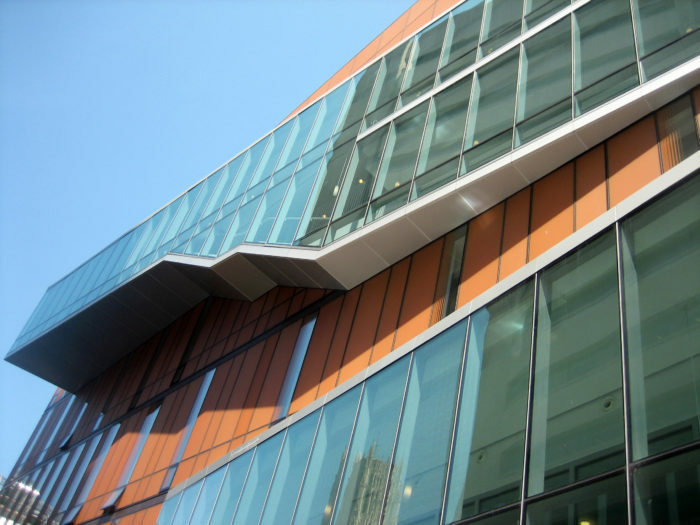 1 surface evokes the look of opaque masonry while still reflecting light; the building’s distinct color is created by a pale terra cotta-colored frit on the No. 2 surface, a bright red-painted back panel beneath, and bronze-colored aluminum panels at floor lines. 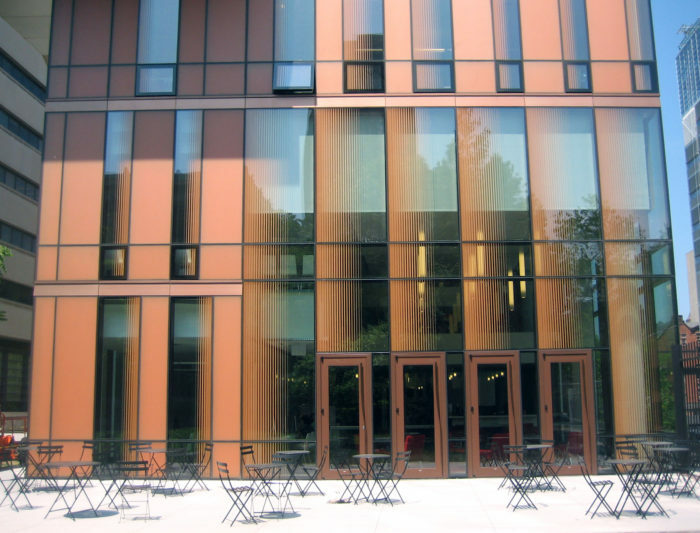 Glass is structurally glazed into a bronze-colored aluminum frame, creating a warm effect that varies throughout the day and seasons. Photographs 1-3 by Whitney Starbuck Boykin; Photographs 4-7 by Heintges.